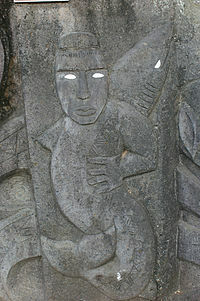 A basalt stone relief depicting Avatea in Rarotonga, Cook Islands. In Cook Islands mythology, Avatea (also known as Vatea; meaning 'noon' or 'light') was a lunar deity and the father of gods and men in Mangaian myth of origin. His eyes were thought to be the sun and the moon; he was also known as the god of light. According to one myth, Vari-Ma-Te-Takere (The primordial mother) created six children from her body. Three were plucked from her right side and three from her left. The first of which was Avatea, the first man, who was perceived as a moon god. As he grew he divided vertically into a hybrid being; the right half was a man and the left half a fish. In song, the gods are called "children of Vatea". The same shortened phrase is in use at Rarotonga: at Aitutaki and Atiu the full form "Avatea" is used, e.g. kia kakā te mata o Avatea Nui meaning "when the eye of Great Avatea is open;" in other words "when the sun is in its full glory;" still in contrast with the darkness and gloom of Avaiki, or the Underworld.